Cloud Monitoring is all about monitoring, evaluating and managing the cloud-based applications, services and infrastructure. In order to have a real-time look at the user’s activities, it is necessary that enterprises make use of different cloud monitoring tools. 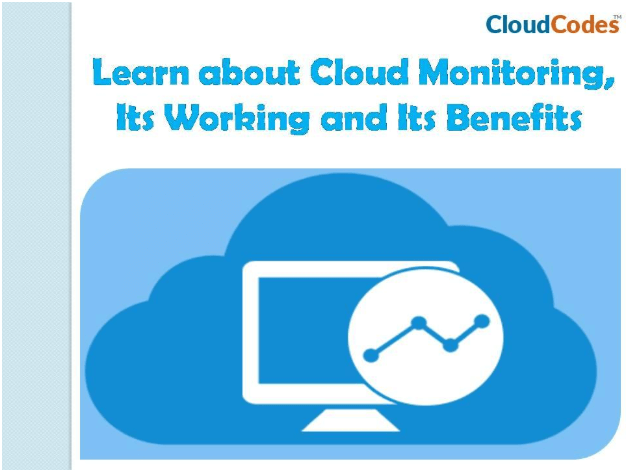 This blog will explain briefly about cloud monitoring, its working and its benefits. Cloud monitoring is not just a deep analysis into the Azure, Google or AWS servers. There are many other services in the cloud infrastructure that needs to be monitored. The enterprises can gain immensely from the monitoring service of cloud-based applications and it can be utilized along with others like Office 365, Gmail, and Zoho Mail etc. The conventional tools of monitoring are used for the cloud services. But to monitor the server, there is a requirement of additional tools other than the basic tools. Nowadays, there are tools which just focus on the cloud monitoring of Salesforce, Office 365 etc. From Independent SaaS Providers: The SaaS providers have an expert panel that manages the performance of the services that the enterprises have purchased. Money is to be paid only for the services that are purchased. From the Cloud Service Providers: Here, the tools are the part of the services rendered by the cloud service providers. The integration is seamless and there is no requirement of installation software. The infrastructure and configurations are already available and hence the installation becomes quick and easy. Other than the hardware, there are dedicated tools that can be used by the host for cloud monitoring. The cloud monitoring solutions can be used by every enterprise, big or small. If the enterprise wants to scale their operations on the cloud, then appropriate monitoring software is available to scale it. In subscription-based solutions, the cost becomes less because there is no requirement of additional expenditures for infrastructure. Also, since the maintenance price is distributed among several end users, the overall cost gets drastically reduced. When any enterprise faces local problems regarding their server, workspace or physical infrastructure, the cloud monitoring activities are not disrupted. Hence, there is no interruption on the monitoring activities on the cloud. There are available software to be utilized on portable devices like Smartphones, tablets etc. thus, the enterprises can monitor their services and apps constantly. From the security and performance aspects, monitoring of all cloud-based apps and services is a must for enterprises to leverage their work on the cloud. The challenge is in selecting the right APM (Application Performance Monitoring) solution. The experts are of the opinion that CASB solution, given by a Cloud Access Security Broker, is the best cloud monitoring tool. It helps enterprises to monitor their cloud services and apps real-time. The benefit is that the clients get a single dashboard where the admin can view all the activities performed by the staff of the enterprise. Whenever anything suspicious is detected, the CASB solution sends out a warning message that appears on the dashboard. The admin can take appropriate action before the occurrence of disaster. Moreover, with umpteenth number of users worldwide, CASB solutions have proven to be the most effective and efficient cloud monitoring tools helping enterprises to save and secure their data in the cloud.